#1 Copper Bare bright is a common copper material found in scrap yards, around demolition and construction sites. Bare bright scrap consists mainly of uncoated and unalloyed copper wire, free from any attachments, thicker than 16 gauges. Bare bright copper wires are generally found in electrical applications, automotive scrap, demolition and construction debris, and mechanical applications. It is often worthwhile to clean and remove any coatings from wiring, using manual tools or electric wire strippers, to produce a bare bright materials which have a higher value. 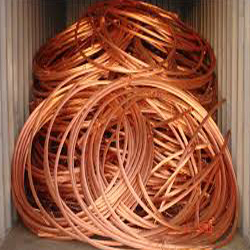 #1 Copper Bare bright is considered to be a very valuable material and can be sold to scrap yards and dealers at high prices, usually by the pound.